Wrinkles, skin folds, and facial lines are a natural part of the aging process, but can easily take away one’s self-confidence. As we age, the skin loses its volume and can cause skin folds, wrinkles, and hollow areas. While many wish to treat these concerns, the idea of surgery and extensive recovery time can cause potential patients to be hesitant towards treatment. Fortunately, there is a quick and effective way to treat signs of aging without surgical methods or extensive downtime. At Re: Nu 180 Med Spa in Newington, CT we offer Restylane. An effective way to treat common signs of aging, Restylane is a hyaluronic acid injectable dermal filler that can provide pronounced results with little to no downtime. For more information about treatment with Restylane at Re:Nu 180 Med Spa, book a consultation with us or come by our Newington med spa today! Restylane is an FDA-approved facial filler that requires little to no downtime. Restylane’s main component is hyaluronic acid, a naturally occurring substance in the body that deteriorates as we age. Restylane works to restore areas affected by this process and can restore volume and fullness to the areas treated. At Re:Nu 180 Med Spa in Newington, we carry the entire Restylane line including Restylane Refyne, Restylane Defyne, Restylane Silk, Restylane Lyft. Depending on your treatment goals, we will recommend which Restylane product is best for your needs. Treatment with Restylane products at our Newington med spa is fast, safe, and delivers quick results. Before treatment, we will conduct a consultation with you to develop a treatment plan based on your desired results. Our nurse practitioner will then select which Restylane product and how much product to use based on your needs. For your comfort, topical anesthetic cream will be applied to deliver relatively painless treatment. Treatment generally takes around 30 minutes, depending on the patient’s concerns and the target sites. Following the injection process, the area(s) treated will be massaged to ensure even distribution of the product. Side effects are generally minimal, but can include swelling, redness, tenderness, or bruising at the injection site. However, side effects generally subside within a few hours or days following treatment. After your treatment you are free to return to most normal activities, however, your treatment provider will give you all after-care instructions following your procedure. During your consultation, your nurse practitioner can talk with you about any potential concerns you have about side effects or aftercare. What Are the Differences Between Restylane and Juvéderm? At Re:Nu 180 we offer both Restylane and Juvederm. Restylane and Juvéderm are both types of hyaluronic dermal fillers formulated to treat signs of again. While the two products share similarities, they have different formulations. During your consultation, our nurse practitioner can talk with you about both options and help you decide on the best dermal filler for your needs. Results from treatment with Restylane are immediate. However, most patients report seeing the best results after side effects have had a chance to subside. Depending on the treatment area, patients can expect results to last anywhere from six months to a year. At this time, we recommend following up on your Restylane treatment at our Newington med spa to maintain your results. 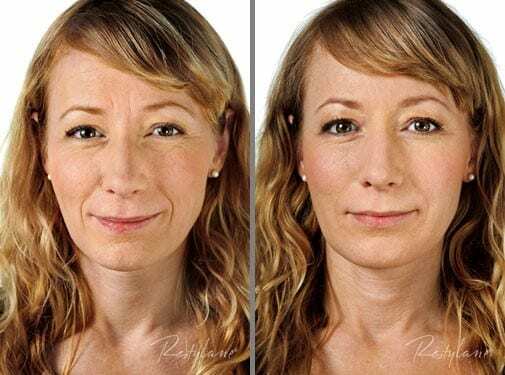 Restylane is a product that can enhance your looks by restoring volume to the face or hands, treating lines and wrinkles, and enhancing hollow areas without surgery or downtime. Get the long-lasting results and look you want with a customized treatment plan with Restylane! To learn more about Restylane and our other aesthetic treatments at Re:Nu 180 Med Spa in Newington, CT, book a consultation today! We are here to help you regain your confidence and achieve your aesthetic goals.